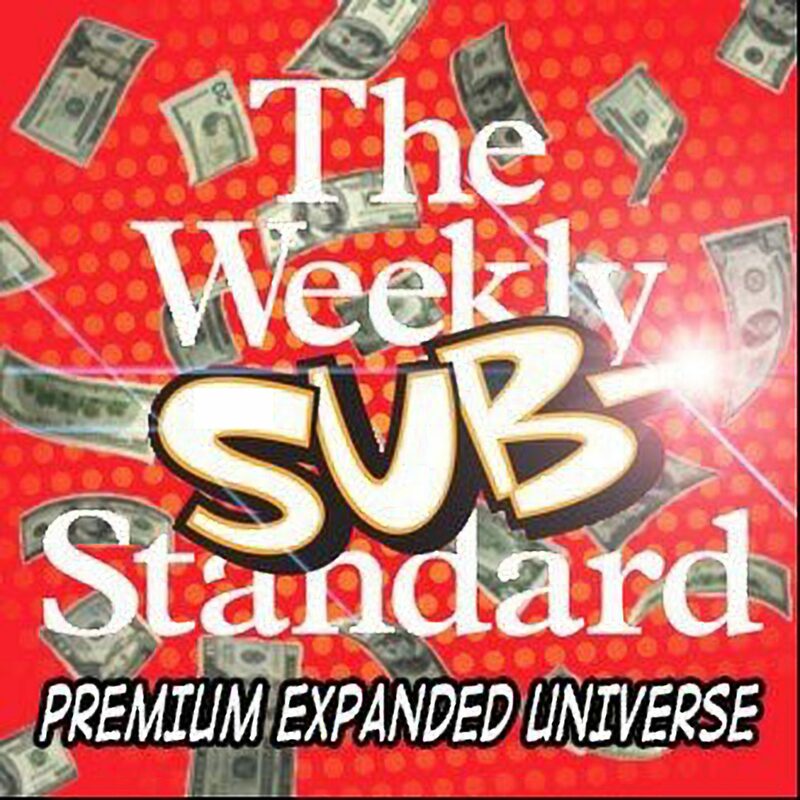 That’s right Substandard fans, another episode of the sitcom is finally here. It’s movie night at Vic’s house. What zany capers will these three podcast hosts get themselves into? Read on to find out! This episode opens outside Vic’s house. Sonny and JVL have arrived and are walking up the sidewalk to the front door together. JVL is visibly weighed down by a large backpack filled with all the stuff he will need inside since he trusts no one to wash their dishes to his standards. At his own home he has replaced all of his drainpipes with industrial strength drainpipes to withstand the intense chemical cleaners he uses on his dishes. Do not worry, dear viewer reader, he hand washes his PrAna pants with a mild cleanser. He would never use detergent off the shelf. What is he, a savage? Sonny: I just pulled up, but it looked like you were just sitting there in your car. JVL: I wasn’t just sitting there, Sonny. I was getting myself situated. Changing watches, changing glasses, making sure I have everything I need for the movie: a clean plate to eat off of, a clean cup to drink out of, my favorite snacks. You, know, that sort of stuff. Vic opens the door, but before greetings are exchanged JVL has to finish his thought. JVL: Sure, I’m not going to wear my driving watch while I watch a movie. Vic: (in his Gene Shalit voice) Sounds like you’re planning to (pauses for effect) watch a movie tonight. Vic: Speaking of watches, I see you’re wearing your Daylight Standard Time watch. Sonny: You have a special (bleeping) watch for standard time? JVL: Well, it’s not that I can’t wear it in the summer. That would be just crazy. Although I do have a nice summer watch. It has a really breathable band. The face has light summer colors. Nothing dark, no coffee tones that make you think of a fireplace and a good book. No oranges or reds that make you think of the pumpkin patch and a nice cup of hot apple cider. And certainly not the heavy look that brings to mind a winter that has extended into March, a watch that makes you think about drinking a Sanpellegrino on St. Patrick’s Day. (Sonny and Vic exchange confused looks about his drink choice for St. Patrick’s Day) It has a lightness to it – not too light, just enough heft so that you know it’s there but not so heavy that your left forearm is visibly more muscular than your right. Vic: For me it’s my right forearm that is visibly more muscular. Vic: What? It’s common among editors! Vic: From using a red pen to edit work from garbage Millennials like you. JVL: (to Vic) Can I tell him why it’s my DST watch without you interrupting me? (Vic nods) Like most Hollywood leading ladies, it’s gorgeous on the outside but fragile and broken on the inside. Its so fragile inside I can’t set the time, so it’s right only half the year – during Daylight Standard Time. Vic: Or if you take a summer trip to Newfoundland. JVL: Sure, but if I’m taking a summer trip anywhere, I’m going somewhere to surf. Vic: Gentlemen, let’s not tarry in the foyer. Come inside. Let me take your jackets. JVL, lighten your load. JVL recently changed into his loungewear, because “only a philistine would wear prAna Axioms to watch a movie.” He’s wearing a base layer of an organic cotton t-shirt made by an aspirational rock climbing company, with a thin long-sleeve, half-zip, organic cotton/merino wool blend Arc’teryx shirt as his middle layer, with an outer layer of a Patagonia full-zip vest. Vic takes their coats and puts them in the closet. JVL puts his giant backpack on the floor next to him. Just as he puts it down he wonders how clean Vic’s floors are. He weighs this against the idea of wearing it the whole time. That would be quite a feat since he got up at 4:30 AM today and ran 15 miles before work while watching a movie (not a TV show…it’s so annoying how people like to watch interesting shows on TV and talk about them) on his phone in portrait mode. Sonny: Let’s take a swing by Vic’s office. JVL: (suddenly angry – who am I kidding? He’s always angry, but now he is visibly angry with veins popping and a quickly-reddening face) I’m not going to stand in front of Vic’s – what time is it? – (bleeping) Georgetown diploma while you talk about Georgetown for half an hour. Sonny: (speaking from the office. He’s suddenly serious) JVL, you’ve gotta get in here. JVL: I’m not falling for that. Again. Sonny: No, I’m serious. Vic took down his pictures of Emma Watson. JVL realizes something strange is happening and runs into the room. On the wall, instead of what Sonny called his “Shrine to Emma” or what JVL called “evidence in a criminal trial,” Vic has framed photographs of Angela Lansbury, Helen Mirren, and the Golden Girls – but not in their prime. What Vic’s wife calls his “shrine to German culture” remains intact on the opposite side of the room. Sonny: What the (bleep) is going on? Vic: Well, with Roy Moore and his, how shall we say — mistakes? — in the news I wanted to distance myself from the whole “older man who’s into younger women” joke. JVL: Except you’re not actually joking about it. Vic: Yes I am. It’s good for ratings. Or downloads. Anyway, I just thought I’d make it clear that I’m not really a creep. Sonny: Well, I’m not sure that’s what you did. Can I just say that I think you overcompensated just a bit? You know there are a lot of beautiful women around your age you could drool over. JVL: Or you could just, you know, be a normal person and not have framed photographs of women on your wall. Sonny: JVL, no offense, but you’re not the best person to be handing out advice on being normal. JVL: Lots of grown men have framed photographs of tennis players in their home offices. Sonny: Do they? Do they? I don’t know. Those are some really short shorts on your Andy Roddick picture. JVL: It’s not that they’re short. It’s an action shot. He’s lunging for the ball. And as he’s lunging, Andy’s muscular thighs are revealed. Sonny: I get that clothing gets jostled in the course of an athletic event. I just don’t see why you need to memorialize it on your wall. JVL: But it’s those thighs, along with a strict diet and ample attention to his core, that made Roddick the greatest American tennis player of the 21st century. Sonny: Besides the Williams sisters. JVL: Don’t you troll me. It’s not going to work. (suddenly taking conscious deep breaths) I know what you’re doing. Sonny: You just think I don’t appreciate Andy Roddick’s thighs. JVL: You clearly don’t. Lower body strength – the non-glamour muscles – are what make tennis players great. You need a solid base for service, to return serves, and for long volleys. If you notice as the match goes on and players’ legs get a little wobbly, their accuracy decreases by a significant degree. Sonny: Can we just be done talking about man-thighs? JVL: I feel like you were the one who brought it up. Sonny: Still. I just don’t want to think about a man’s bare thighs. (he looks up and makes eye contact with the Betty White photograph). Ugh. How about a drink, Vic? Vic: Yes! Let’s serve some drinks.